Teaching Blog Round Up: It's a New Year - Let's Learn About the Months! Happy New Year! I realize that I'm writing to you on one of the most exhausting and challenging days of the school year... it's probably pretty remarkable that you're here and reading! Isn't it ironic that just two weeks ago you were spending so much effort on bringing your students' energy level down a bit, and today you were likely the cheerleader who was trying desperately to bring their (and your own!) energy level up? I think this is a natural time of year to do some calendar study, centering on the names and sequence of the months of the year. Here are a few of my favorite books and ideas for that! Nancy White Carlstrom's Jesse Bear travels through the year with his mom and dad in this book, each month finding a different way to say, "I love you!". I like the way this book helps children connect months with holidays that occur in them. Maurice Sendak's Chicken Soup with Rice is an old favorite. 1962!!! If you were not yet born when this book was written (or your parents weren't, either), I won't mind if you don't remind me of that, thankyouverymuch. :) Let's just call this book timeless, because the lyrical and totally fun expressions are still a delight, as we go through the months "sipping once, sipping twice, sipping chicken soup with rice". So much lovely playing with language! This is a great book to use now, but also to reintroduce at the beginning of each new month by writing each monthly poem on chart paper and providing a small copy for your students' poetry notebooks. There's soooo much opportunity for practicing fluent expression and phrasing while reading these little poems! You and your class will both enjoy Carole King performing this as a "sing-along" on YouTube. I've linked to my favorite of several available versions - this one has the actual pages of the book on the screen - more opportunities to read! Yay!! It's fun to practice the months with the traditional poem, "Apples, peaches, pears, and plums, tell me when your birthday comes." Get a little movement into it by having your kids stand up for their birthday month, or have fun with some kind of silly signal, like putting on an imaginary birthday hat or tossing imaginary confetti into the air. This is a great poem for reading from a chart in two groups. Group One reads, "January", Group Two reads "February", and back and forth for the rest of the months. 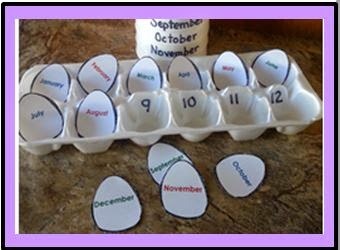 Here's a center idea for practicing the months, and I'll bet you have some leftover styro cups from your holiday entertaining to get you started! 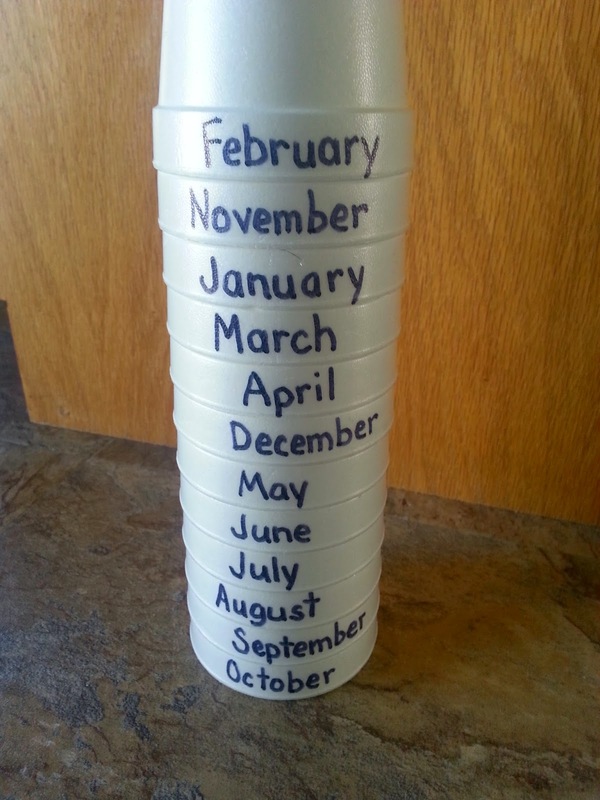 Label the rim of each of 12 cups with a month of the year. Your students will love stacking, unstacking, restacking... you can even make this activity self-correcting by numbering the back of each rim. For more fun, make several sets - your kiddos will have fun racing each other in reassembling the towers. Here's another way to use your cups. Partners can do some mixing and switching, and challenge each other to identify the missing months. ... in this free download! Just click here or on the cover, and enjoy! Today is the last day of the Happy New Year Blog Hop! Hurry on over to my blog to collect five winter freebies for math and literacy, and then follow the links to find more freebies and deals from some terrific bloggers! Happy Teaching! See you again in February! Linda I Love, Love, Love the cup month idea. So simple and effective! Thanks, Teresa, I'm so glad it's useful for you! Happy New Year!